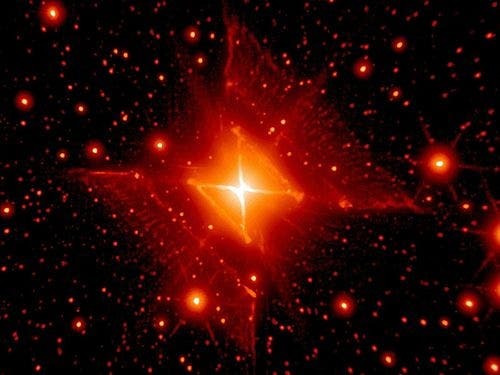 The Red Square Nebula – Is a Future Colossal Hypernova Lurking There? The hot star system known as MWC 922 appears to be imbedded in a nebula creating the shape of a square. The above image combines infrared exposures from the Hale Telescope on Mount. Palomar in California, and the Keck-2 Telescope on Mauna Kea in Hawaii. The theory is that the central star or stars expelled cones of gas during a late developmental stage. Astronomers speculate that the cones viewed from another angle would appear similar to the gigantic rings of supernova 1987A, the brightest supernova of modern times, possibly indicating that a star in MWC 922 might one day explode in a similar supernova. Over time, astronomers have watched and waited for the expanding debris from this tremendous stellar explosion to crash into previously expelled material. A clear result of such a collision is demonstrated below in two frames recorded by the Hubble Space Telescope in 1994 (left) and 1997(right). While the central concentration of stellar debris has clearly evolved over this period, the yellow spot on the ring in the righthand picture announces the collision of an outward moving blast wave with the pre-existing, light-year wide ring. The collision is occurring at speeds near 60 million kilometers per hour and shock-heats the ring material causing it to glow. 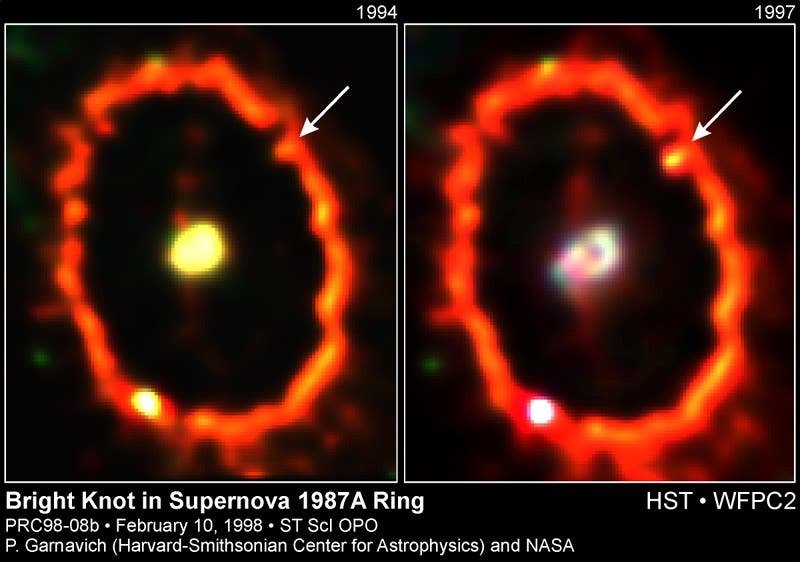 Astronomers are hopeful that such collisions will illuminate the interesting past of SN 1987A, and perhaps provide more clues about the origin of the mysterious rings.